In the School of Nursing, the PMHNP program hosts a Quarterly Mental Health Symposium (QMHS) which typically highlights lived experiences of individuals with mental health difficulties. This quarter, the QMHS will focus on Treatment of Perinatal Mood and Anxiety Disorders (PMADS). This is part 2 of 2 sessions (the first was last spring) with Part 1 focused on the stories of two women who experienced inadequate treatment of severe PMADS. This upcoming event is on February 13th from Noon to 1pm in CL-221 /CL-222 (pizza provided for first 50 registered). The speakers will be one of our graduates, Musumi Mukerji, CNM, PMHNP-BC and Lisa Hanes, CNM, LMFT. 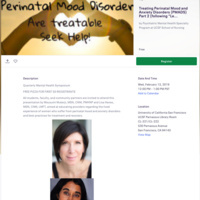 To register, please go to https://www.eventbrite.com/e/treating-perinatal-mood-and-anxiety-disorders-pmads-part-2-following-lessons-learned-from-mothers-tickets-54395884555. All are welcome!